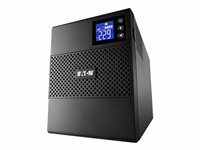 Eaton 5SC UPS provides line-interactive, affordable and reliable protection for small business servers. It includes a LCD interface for real time status and measurement. This unit also possesses the Advanced Battery Management (ABM) technology that increases battery lifetime. It is line interactive with Automatic Voltage Regulation (AVR). With its 4 IEC outputs and compact design the 5SC fits anywhere easily. Eaton 5SC UPS provides line-interactive, affordable and reliable protection for small business servers. It includes a LCD interface for real time status and measurement. This unit also possesses the Advanced Battery Management (ABM) technology that increases battery lifetime. It is line interactive with Automatic Voltage Regulation (AVR). With its 8 IEC outputs and compact design the 5SC fits anywhere easily.